Subaru is re-entering the market for big crossovers with three rows of seating -- a move that puts the surging brand in more direct competition with some of its bigger rivals but also promises to jump-start the company's sales gains just as growth slows. 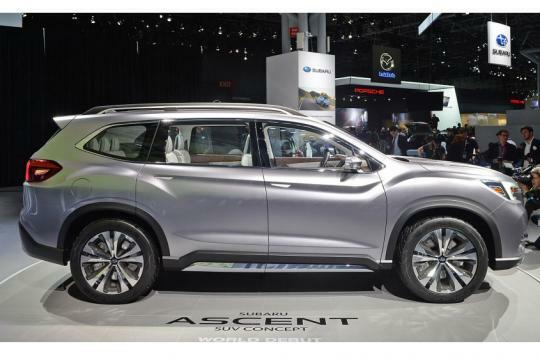 The all-new Ascent, unveiled on the eve of the Los Angeles auto show, launches Subaru right back into the hotly contested three-row crossover segment, one the automaker has not been able to tap since output of the ill-fated Tribeca ended in 2014. Subaru executives acknowledge the Tribeca wasn't really a seven-seat vehicle.  Nor did its styling and functionality mesh with what Subaru customers had come to expect. Dealers say some owners had trouble getting in and out of the Tribeca. The Ascent, on the other hand, at 196.8 inches long, 76 inches wide and with room for seven or eight passengers, is the biggest Subaru ever. It will compete directly with the Ford Explorer, Toyota Highlander, Chevrolet Traverse and Mazda CX-9 and arrives as the large crossover segment, a key source of profits for automakers, has grown 15 percent this year in an overall light-vehicle market that has cooled 1.7 percent. 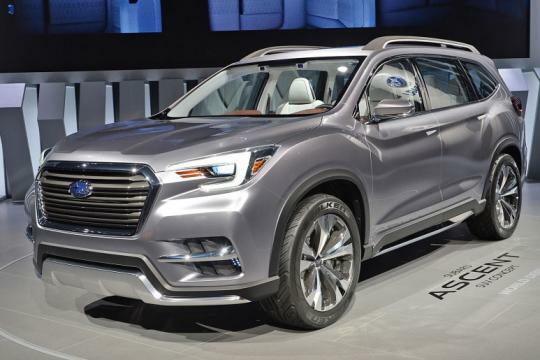 "The big question with the Ascent is whether or not Subaru buyers are finally ready to embrace a large SUV," said Edmunds analyst Jessica Caldwell. "Subaru has come a long way from its days as a quirky niche brand, so the Ascent has a much better chance of success." The crossover figures to be the answer that Subaru dealers have been looking for when customers outgrow the venerable Outback and head to other brands. Hints of the strong-selling Subaru Outback and Crosstrek are evident in the Ascent, as is the large greenhouse that has been a staple of the Forester. Subaru officials maintain that all-wheel drive, standard roof rails, an 8.7-inch ground clearance and 72.6 cubic feet of cargo space will help Ascent appeal to Subaru customers' outdoorsy activities just as much as its smaller siblings. 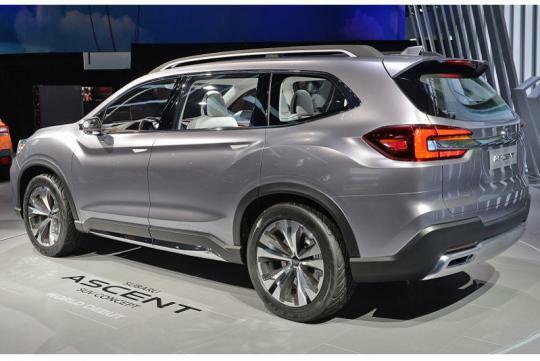 The Ascent is the first all-new Subaru model since the introduction of the then-XV Crosstrek. It will also come with an all-new powerplant: a turbocharged 2.4-liter boxer engine that produces 260 hp and 277 pound-feet of torque. The base trim line comes with a standard bench seat in the second row, while second-row captain's chairs are a no-cost option on Premium and higher trims, Subaru said.